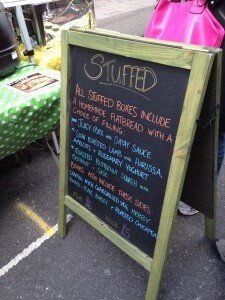 “Delicious homemade flatbreads stuffed with intensely flavoured fillings and refreshing crunchy sides” proclaims the Facebook page of street food vendor Stuffed – a stall that has popped up at the Ashton Court Producers’ Market, the Temple Quay Market, Bristol’s BIG Market, Make Sundays Special and more. After following them on Facebook for a while, we finally had the chance to sample their flatbreads at Make Sundays Special on Corn Street on September 29th. It seemed to be a tricky day for them as the wind threatened to blow their gazebo away a few times while we were there – but it didn’t stop the queues of people who were all keen to try their flatbreads. The premise at Stuffed is simple: buy a veggie box for £5 or a meaty box for £6, which includes a homemade flatbread with a choice of fillings, along with a selection of salads. The veggie option on the day was roasted butternut squash with beetroot and sage – and we also had the option of pork with satay sauce – but both decided to go for a filling of slow roasted lamb with harissa, apricots and rosemary yoghurt. The food smelt absolutely amazing, with one member of the team cooking and filling the flatbreads, the other taking payment and adding the three salads to each customer’s box. After a few minutes of waiting (flatbreads are cooked to order, so the wait really wasn’t an issue), we were given our food and headed back to the centre to find somewhere to sit. We were definitely impressed. 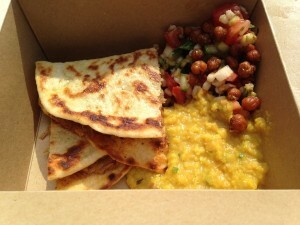 The three sides that accompanied the flatbread were all very different: the creamy slow cooked lentils with chargrilled vegetables were perfectly seasoned, and the tomato and pearl barley salad was lovely and fresh, punctuated with fresh herbs. I fell in love with the chickpeas that were sprinkled on top of the salad, which had been roasted with spices and had a lovely crunch and flavour. And the flatbread itself? Well – it was delicious, more like a pancake than a flatbread in terms of its flavour and consistency, and it was obvious that it was straight from the grill. The filling was amazing, lovely tender lamb in a rich and creamy sauce, the only complaints being that it was a little oily, and that we could easily have eaten more! It’s easy to see why they were so popular on the day, with bold flavours and well-cooked and seasoned food that offered a healthier alternative to many of the other stalls that were there. 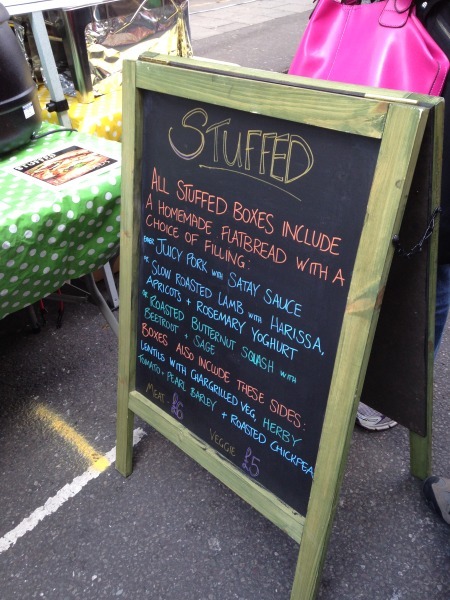 Stuffed are appearing in various places throughout Bristol and further afield – have a look at the events tab on their Facebook page to find out where to get your next fix!